In this Thursday Therapy episode, Glenn explains how to deal with the pull towards weight loss quick fixes with compassion, mindfulness, and patience. 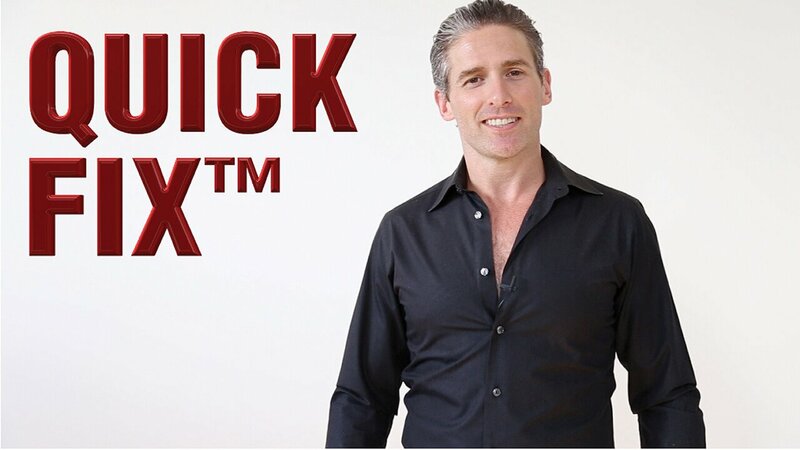 He talks about the normality of wanting a quick fix, how to avoid the allure of dieting, and slowly embracing non-dieting ideas. Glenn finishes with an interesting idea for both health professionals and the people seeing them. Hey guys. I’m here to let you know about my new weight loss program. It’s called the quick fix and it’s not like anything you’ve ever seen before. What, you don’t want shredded abs, it will transform your life in just six weeks we have a range of pseudo-scientific studies from the team of doctors that we have on the payroll. This program is so good I don’t even need to tell you what it involves. It could be beans from some remote part of Africa, the real paleo diet where you don’t eat for a whole week then devour the entire limb of a woolly mammoth or it could be acupuncture that it’s so powerful it’s delivered by a team of Buddhist monks that you will never see but have dedicated their entire life solely to your amazing transformation. The fact is you need this program and I can say that without knowing anything about your genetics, anything about your medical history, anything about your eating habits, anything about your physical activity, in fact I can say it without even knowing what you weigh because I know I’m talking to a human being and all human beings need to lose weight, right? Welcome to Thursday Therapy, I’m Glenn Mackintosh, the weight psych, and the question we’re answering today is about quick fixes. Hi everyone, welcome back to Thursday Therapy. I hope you’re doing well with your homework of unplugging from your mobile phone and today we’re going to answer a professional question from Louise Wildbore and it’s about how you deal with that pull, that a lot of us have at some stage or another, towards a quick fix. “Hi Glenn, it’s Louise Wildbore here, the creator of the online program mind what are eating and I have a big question for your Thursday Therapy. It is a professional question because I do run an online course around mindful and intuitive eating a super empowering approach but it’s a question that I think a lot of your followers will relate to and it’s around the people who are really feeling stuck with that desire for a quick fix, with that really strong desire just to lose a bunch of weight and to lose it quickly and to have it be quite painless, so in my course we go along and we talk about the research behind why diets don’t work and we take it a step further and we look at people’s own stories of weight loss and we really analyse are you one of the people that diets work for or not and then we go into the empowering self-compassion, self-kindness approach and the feedback that I’m getting people are like I love this course and intellectually I’m totally with you, I get it that diets that work, I love the concept of a mindful and intuitive approach to eating a non-date approach but if I’m really honest if I’m really struggling to genuinely step away from the dieting world, I’m really struggling because I’m still feeling really attached to the quick fix, quick result diet, so I’m struggling, I’m still stuck on going through the process but really almost a pseudo-dieter still, what advice do you give to those people, Glenn. I look forward to hearing your response and I hope that this question is helpful for a lot of your followers as well.” So, thank you for your questions, Louise. It’s a brilliant question and great video too you look really good in the video, so I thought my new item of clothing would be my new jacket because I didn’t want to be underdressed for my own Thursday Therapy but jokes aside this is a really good question because a lot of people if they’re honest when they are following a mindful or intuitive eating approach at some stage or another something will happen someone they know will lose a lot of weight or they’ll see a photo of themselves and think do I really look like that or they’ll hear about the next scientifically-based thing that’s out there and they will get a really powerful pull towards a quick fix, so let me give you and all the professionals and everyone else out there my ideas on what really helps my clients with this one, so the first thing that I want you to do is I want you to treat these thoughts with some self-compassion these thoughts are so normal that we couldn’t ask you not to have them, in fact I consider them a natural part of the process of moving into a non-dieting space and really non-dieting was born out of the understanding of the inherent harm in judgments and rules so the last thing that we want to do is create a blanket rule that there’s something inappropriate about having any desire to lose weight. That’s where we’d start off with just understanding that these feelings and these thoughts are completely normal, so there’s no need to judge yourself about having them, so knowing that these thoughts and feelings are completely normal. I talk to my clients about what we call dieting resilience and that’s that ability to avoid the lure of the next big diet, that ability to in real time create mindfulness that you can understand these are the thoughts the feelings and the sensations of that quick pull and I’m kind of locked into that right now but then to step away and see it for what it is and urge a desire of pull towards the quick fix and then in real time connect with that more logical, rational, helpful part of you that says this is probably not going to work to help you do this. You can create some media literacy and look into the dieting industries ads and the way that it promotes all of these false hopes in order to hook you in that way when you do get hooked it makes it easier to step back and say oh yeah I saw that really thin, really happy person and it got me back into that quick fix mentality or I saw that before and after shot and it made me think all that could be me, so you can really understand in real time what those dieting messages are saying to you and then create that dieting resilience the other thing that I sometimes like to do is just encourage my clients to think really pragmatically, yes 99.9% of people who see me would love to lose a lot of weight quickly but we know if you’ve done four, five, six of these before that the seventh time is probably not going to work, like me I would love to go and bet my life savings with a casino right now, bet it on black and double it, that would be really cool but at the same time that logical, rational part of me kicks in, okay well the risk is just far too great and the odds are just no good and it’s the same with dieting. The third thing that I want you to do if you’re having trouble fully embracing the non-dieting approach is just to give it time. For a lot of people I see they are pseudo dieters. I love that word noise and a lot of our clients are going to be hearing that over the next few weeks, it’s kind of like I really do love these non-dieting ideas but then I also have a foot really firmly planted in, but I still want to lose weight and to take that foot out and until you’re both feet in, fully a non-dieter, that takes a lot of time. I suppose that that non-dieting is the opposite of a quick fix and the irony is that even the way we embrace non-dieting is not a quick fix, it’s a process that happens over time and that can be a little bit challenging because we’re conditioned to want quick fixes in this area, so that would be my last piece of advice is just to give it time because it doesn’t happen overnight. So, guys as a final idea before we finish up I just wanted to share with you something that I’ve been finding really useful as a practitioner, it’s one of my goals to experiment with this in my practice this year and I’m finding it really valuable and I think it might help you guys as practitioners but also people who are looking into following the non-dieting approach themselves. I think it’s really important in non-dieting that we understand our principles, that we understand the research behind those principles and so we know when and how to apply them. I worry in the non-dieting space though that we as practitioners and therefore by extension the people that follow our approach are almost dogmatically holding on to our principles and what I mean by that is not that we should abandon all of our principles but I think non-dieting was born out of the ineffectiveness and potential harm of traditional diets and the dogma associated with clinging rigidly to weight loss. At the same time, I worry that by clinging rigidly to non-dieting principles with every single person that comes in the door in a similarly dogmatic way that we potentially undermine our ability to help the people that we work with best and new people as consumers of the non-dieting approach, potentially limit your ability to apply an approach it’ll really work for you. So, what I don’t mean is let’s try out all the principles but I personally have been having a lot of success in reminding myself in sessions that everybody is different and the principles are really important but more important than the principles is the person that’s in front of us. So, that said guys thank you for being with me for another Thursday Therapy and Thank You Louise for such a great health professionals question. We’ll provide a link to Louise’s website so you can check out her mind body eating program and also a link to Louise’s Facebook below. Having said that guys I know a lot of people who really grapple with this people who are doing diets, people who are following non-dieting, approaches people who are thinking of bariatric surgery, all wrapped up in this question of do I go into a fast, easy, quick fix weight loss, so if you know any professionals who are benefit from this or anyone personally, please share it with them, that’s what we make these videos for and of course if you like the video and you want more please subscribe for regular Thursday Therapy. Until next fortnight have a great couple of weeks and I will really look forward to seeing you soon. Hey Buddy!, I found this information for you: "EPISODE 24 How to deal with “quick fix” feelings". Here is the website link: https://www.weightmanagementpsychology.com.au/episode-24/. Thank you.